Here is the Slavonic: Днесь вернии людие духовно торжествуем, прославляюще Заступницу усердную рода христианскаго, и, притекающе к пречистому Ея образу, взываем сице: О Премилостивая Владычице Богородице, подаждь нам нечаянную радость, обремененным грехи и скорбьми многими, и избави нас от всякого зла, молящи Сына Твоего, Христа Бога нашего, спасти души наша! And here is the legend behind the icon, and the Akathist prayer. Once upon a time, a “man of many sins” would set out every evening for riotous worldly pleasures and amusements. 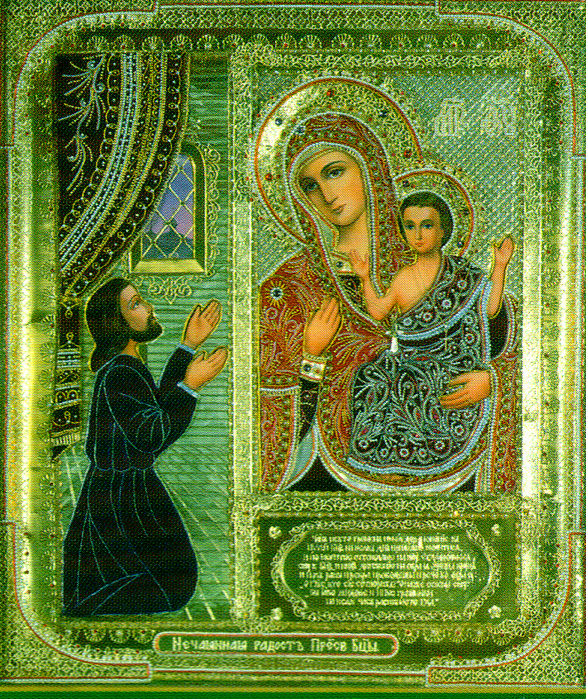 And every evening, before leaving the house, he would stop at his household icon and venerate the Mother and Child, saying “Hail, Full of Grace!” But one night on his way out, the man cries out in astonishment when the Child in the image begins to bleed from wounds in his hands, feet, and side. At first, those words drove me away from this icon, and this story. That judgment of Mary’s (and the many versions of this icon where Our Lady beams x-rays of wrath from her eyes to the young man’s heart) didn’t seem like Mary in the Scriptures, with her one spontaneous “Magnificat” in a lifetime of near silence, the woman with seven swords of heartbreak who never raised a word of reproach. But then, in my new copy of Father Arseny: Cloud of Witnesses there was a lovely chapter about bereavement and healing, giving a translation of the Prayer of Unexpected Joy with no sign of the race guilt. That encouraged me to look up the original Russian. Apparently the legend was recorded by Dimitrii Rostovskii (1651-1709) in his work Руно орошенное, or “Dew-Bedecked Fleece,” named for the miracle experienced by Gideon in the Book of Judges. Apparently Dimitrii added the race idea as a Scared Straight approach for his work with men afflicted with late-stage alcoholism. Apparently this shocked quite a few of them into giving up drinking for good. Nowadays, Orthodox texts keep the prayer but omit that phrase, substituting the idea that Christ suffering is a response to anyone who deliberately chooses the same downfalls over and over. One such amended source is the extensive illustrated icon & prayer site PravIcon, which also shows 32 color versions of “Unexpected Joy,” visible if you scroll down. Another amended form of the prayer appears on PravMir.ru, the outstanding cornucopia of Orthodox religious culture, with a very nice article dedicated to this icon. In the end, the man in an unprecedented flash of empathy grasps that his actions really do ripple out and affect other creatures. He has a total change of heart, and asks Mother and Child to forgive him. Then he discovers the unexpected joy that all his sins and their effects are washed away, along with the addictions and compulsions that were driving him out of the house. From that moment, he leads a reformed life. But that is just where this icon comes in. It’s a reminder that it is never too late for a true change of heart. Unexpected Joy is the promise of atonement. It’s the hope that anybody can, as Brother Lawrence said, at least pick up a straw off the ground for the sake of goodness and love, and start anywhere. That idea came to mind on my February walk on the greenway. By the end I’d caught a chill that flared up my arthritis and later led to a day or so of coughing and hunkering in my blankie corner. The day of cold pavement also whammed all four bunions until for the last long hill home I rolled along the sides of my feet like a sailor on a stormy deck. More than that, the absence of neighborly rapport among the speeding bikers and joggers all afternoon finally brought on a whole cloud of emotional darkness. Also this was my first Sunday of taking a break from all church-going, because congregational interactions leave me baffled and hurt, so out on the trail the discouraging thought came along If only you had GOOD PEOPLE SKILLS, then you would be IN CHURCH like other Christians, and would not be in this pickle. So at the foot of the last daunting mile hill before home and a hot Epsom Salt foot bath, suddenly the icon prayer came to mind. I pulled out my Church Slavonic prayer book to see whether by chance it appeared in there. Sure enough! So I learned it by heart right then, one word and step at a time. “Днесь вернии людие/ духовно торжествуем… Today your faithful people rejoice in spirit…” Praying in Slavonic is like biting into sourdough-desem whole rye bread after a croissant, or putting on ice cleats over silk slippers — it adds brass ballast to the job. In no time, even though it was still all about dusk and cold and joint pain, the prayer illumined everything in a whole different way. So learning it brought a little thread of hope that even a person who gets tired and discouraged and cold easily can still find some unexpected joy and get better at dealing with life. In bed that night it took forever to get warm, and I woke up often; but all along the prayer kept running in mind like a delicate thread of unbreakable gold. Anyway I was chanting it right out loud all the way up the hill in the dusk. This completely fascinated a boy of 10 or so. He was walking with his grandma. He ran right over to me to find out what I was up to. The three of us all chatted a bit. He looked and looked at me, trying to think up something to say, and finally said “This is a nice day, isn’t it?” And of course he was right. This entry was posted in Uncategorized and tagged Dimitry of Rostov, акафист, димитрий ростовский, икона нечаянная радость, отец арсений, Father Arseny, icon "Unexpected Joy", icons, руно орошенное. Bookmark the permalink.